19 - 21 Jan 2018 Baby World: Don’t Miss the Largest Baby Fair in Singapore at Singapore Expo! 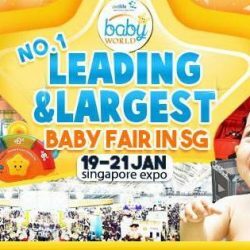 Baby World is the No.1 Largest & Leading Baby Fair in Singapore, with 150,000s of products from over 1000s of leading and boutique baby brands all under one roof! Happening from 19 to 21 January 2018 at Singapore Expo, expect massive discounts up to 90% and lots of goodie bags and prizes!